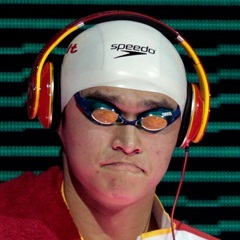 Budapest - China's Sun Yang won the men's 400m freestyle final in emphatic style at the world aquatic championships Sunday, as his bitter Rio Games rival Mack Horton trailed home a distant second. Sun clocked 3min 41.38sec to claim gold well ahead of the Olympic champion Horton, who had previously dubbed his rival a dope cheat, as the Australian took silver some 2.47 seconds adrift. Italy's Gabriele Detti took bronze at 2.55sec. It was sweet revenge for Sun, who splashed the water and gave a triumphant roar, having been beaten by Horton in the 400m final at last year's Rio Olympics following a war of words between the pair. Horton had dubbed Sun a 'drugs cheat' after the Chinese served a three-month ban in 2014 after testing positive for a stimulant. In turn, Sun accused his Australian rival of 'dirty tricks' to try and put the freestyle specialist off his game. Sun's victory in Budapest means he now has eight world gold medals spanning four championships dating back to Shanghai in 2011. He has now won the 400m world title at each of the last three championships after his Barcelona 2013 and Kazan 2015 triumphs. Horton could not hide his disappointment after the race and said his time was disappointing. "I thought I would have been faster, the time stings more than losing," said the 21-year-old. "I thought I was capable of more tonight, I tried to be stronger in the front part of the race. "This is the start of the cycle towards Tokyo," he added with one eye on defending his Olympic title in 2020.